If you want to make a difference in young children's lives, becoming a teacher is one of the most fulfilling ways to inspire, educate, and contribute to the development of the next generation of students. Graduates from early childhood education programs typically become preschool teachers, childcare center directors, and kindergarten teachers. The degree requirements for early childhood educators vary depending on the state, and can range from an associate degree to a master's with certification. Schools always need more creative, patient, and organized teachers who love working with children. The Bureau of Labor Statistics (BLS) projects a job growth rate of about 7% for early childhood educators between 2014 and 2024. Online early childhood education programs are a convenient option for working professionals who want to advance their skills on a flexible schedule. For more information on early childhood education degrees, read on to learn about the many career opportunities available in the field and the academic requirements needed to earn a job. The degree you need depends on the educational setting and the state. Preschool teachers in states with Head Start programs, for instance, must have at least an associate degree; in other states, they may need early childhood education degrees at the bachelor's level. BLS notes that your job prospects will increase with a postsecondary degree in the field, and many professionals choose to earn an online bachelor's in early childhood education while they are working. Additionally, many preschools require national certification, such as the Child Development Associate (CDA) or the Childcare Professional (CCP). Associate-level early childhood education degrees may qualify you to work in some education settings, including preschools, depending on the state. Preschool teachers in Head Start programs, for instance, are required to have at least an associate degree; however, in many states they need a bachelor's. Child care workers, family support specialists, and teacher's aides are all positions that require at least a high school diploma. Online early childhood education programs give you the flexibility to pursue this credential at your own pace. Many associate graduates go on to earn their bachelor's in early childhood education online to better their career prospects. The median salary for a family support specialist is $30,830 per year, $24,900 for a teacher's assistant, and $20,320 for childcare workers. Job prospects in the field of early childhood education are favorable, and are expected to increase by approximately 5% through 2024. Early childhood educators prepare young children for kindergarten and beyond and are integral to their development as happy, healthy children. Though a bachelor's degree is not always required to become a preschool or kindergarten teacher, most teachers hold one, and having a bachelor's makes you more marketable and increases your job prospects. 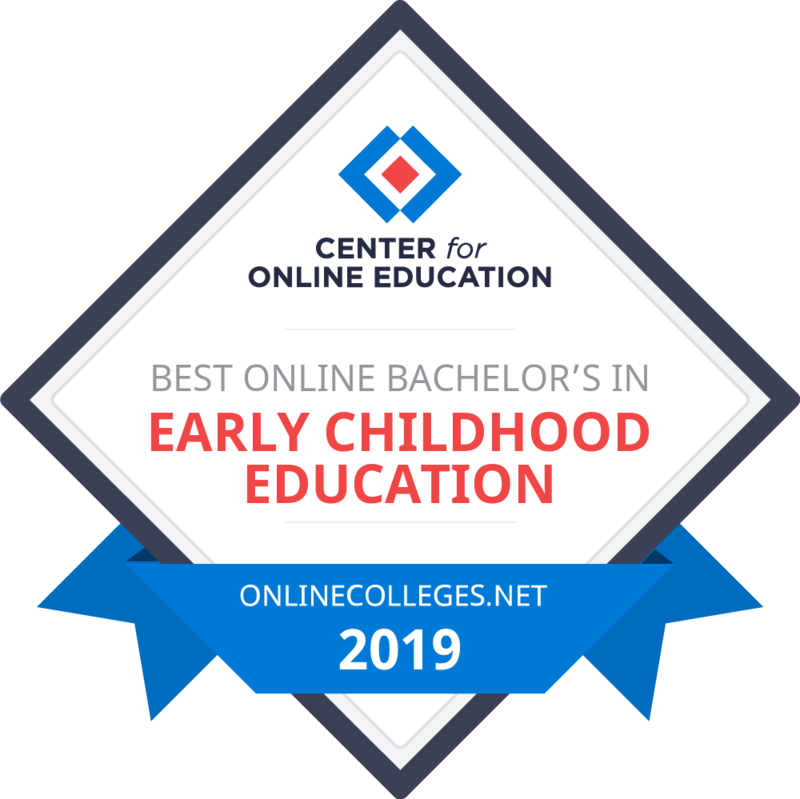 Earning a bachelor's in early childhood education online will help prepare you for the industry without disrupting your current work or at-home obligations. Some schools may offer an accelerated bachelor's in early childhood education online. The median salary for preschool teachers is $28,570; $54,550 for kindergarten and elementary teachers; $45,670 for preschool and childcare center directors. The BLS projects a 7% increase in preschool teachers from 2014 to 2024, 6% for kindergarten and elementary school teachers, and 7% for preschool and childcare center directors. Based in Irvine, CA, Brandman University (BU) is a leader in making higher education accessible to working adults. With multiple satellite campuses and an array of online degree programs, the university uses the Brandman Instructional Design for Engaged Adult Learning model to provide the same caliber of education in virtual and brick-and-mortar classrooms. BU’s online programs are consistently recognized by U.S. News and World Report for their excellence, and the school’s online BA in early childhood education is particularly distinguished in terms of its quality and rigor. The 51 credit curriculum adheres to national and California state licensure requirements, while two required practicums provide graduates with hands-on experiences to supplement their coursework. This bachelor’s degree emphasizes high-quality, inclusive care and education to children, and includes classes such as teaching in a diverse society, the social and emotional impacts of education on children, and instructing dual language learners. All degree candidate complete their program with a capstone project. With two campuses in the Miami area and robust online degree programs, FIU is able to providing a flexible education options to students. FIU offers 21 online degree programs with coursework students can access 24/7. Online students also work with a personal success coach to help ensure they reach their academic goals. The university’s online BS in early childhood education offers convenient enrollment in the summer, fall, and spring semesters. By exploring the cognitive, language, and social and emotional development of children, the early childhood education curriculum prepares students for roles as childhood specialists, preschool directors, preschool teachers, and childcare workers. Students combine theoretical and practical knowledge to learn the foundations of early childhood education, and develop specialized skills, such as assessing, evaluating, and diagnosing children with special needs. The program also provides nine elective credits for students to explore a topic relevant to their career goals. Located near the banks of the Ohio River, the University of Cincinnati first offered a distance learning program in 1984. Today, 12 of UC’s departments facilitate online degree and certificate programs, providing working adults and nontraditional students with a variety of options to earn their college degree. The bachelor’s degree in early childhood education equips students with theoretical and practical skills to increase their impact and reach in the field of early childhood education. Coursework prepares students to work with children up to the age of five, and classes give students the chance to study critical topics like assessment, literacy, and social development. UC’s curriculum is taught by faculty members with firsthand experience in early education, providing students the practical knowledge they need. Successful completion of all degree requirements may lead to recommendation for Ohio’s Pre-K licensure. Named for the state it calls home, Granite State College in Concord, NH provides educational opportunities to students of all ages and backgrounds. With a variety of online, evening, and weekend courses, the college effectively educates working adults. The school's online, field-based BS in early childhood education program is dedicated to providing flexible, challenging curriculum with an affordable tuition. Online students living in New Hampshire also have the option to attend classes in person as they work toward their degrees. Granite State’s curriculum emphasizes social science research and early childhood psychology, providing graduates with an understanding of developmentally appropriate practices. Coursework in areas like special education law, behavioral interventions, and statistics ground students in basic research, while the culminating teaching experience and seminar provide practical application. And because 84% of students transfer into Granite State, the college works hard to accommodate students’ prior education. Saint Mary-of-the-Woods College is a private, four-year liberal arts college with a main campus in Saint Mary-of-the-Woods, IN. The college’s online presence, "Woods Online," offers 25 different majors and the opportunity for students to complete their degree requirements fully online. The bachelor’s degree in education thoroughly prepares graduates for teaching and leadership roles in early childhood education, and possible licensure in Indiana. Students may select from nine different areas of focus in their degree, but each is required to take core education classes before specialized classes in their concentrations begin. Those selecting the pre-school to 3rd grade concentration are required to complete coursework on early childhood pedagogy and early childhood social and academic development, among others. They must also complete a capstone project on topics that range from social justice to sustainability. All graduates of the program are eligible to take state teaching certification exams, which opens additional doors for those preparing to teach in elementary schools. Fort Hays State University, based in Hays, KS, serves students in the heartland and beyond through its virtual college. The school is ranked by U.S. News and World Report as one of the top online education programs in the country, with 30 fully accredited programs. The online BS in early childhood education prepares graduates to teach regular or special education to children from infancy to third grade. The curriculum mixes foundational material in human growth and development and issues in special education, with more specialized topics in assessment, literacy, and early childhood psychology. Graduates can be qualified for licensure to teach or work as education professionals at early childhood education facilities in Kansas and many other states. Some field work is required for completion of this degree, but students can complete this requirement at a school in their local area. Situated in the Pacific Northwest, Concordia University-Portland is a private Lutheran liberal arts college committed to helping students live with moral integrity and a commitment to justice. Concordia offers six online degree programs with students in all 50 states and 11 different countries, with flexible, applicable curriculums that students can practically integrate into their current careers. The online BS in early childhood education prepares students to assist in the academic development of children under the age of five. The curriculum at Concordia is taught by professionals who have direct experience with their subject matter, and who place an emphasis on educating the whole child. A diverse offering of courses cover literacy, assessment, equity and justice, special needs, and music and literature. Degree-seekers with previous credits toward associate’s and bachelor’s degrees in early childhood education may have the opportunity to transfer many of their credits and graduate early. Based in Winfield, KS, Southwestern College is a private institution that has provided educational opportunities to students since 1889. Its professional studies programs provide flexible degree programs online and across three satellite campuses to working adults. These programs also work with students to ensure they are able to transfer credits from other institutions, and classes are offered in convenient, 6-week blocks. The BA in early childhood education is an innovative and student-focused degree. SC requires early childhood education students to complete foundational coursework in child motor development, children’s literature, and linguistics, among others. Specialized courses and a field experience round out the degree. Students leave Southwestern prepared for teaching and leadership roles in the field. California Baptist University is a private liberal arts institution based Riverside, CA. CBU’s online program offers degrees in twenty majors, many of which can be completed in two years. A shorter degree track translates to tuition cost-savings, which is a major plus for many students. The online bachelor of arts in early childhood studies acquaints students with foundational knowledge of early childhood development and learning, and equips them with the skills they need to succeed in the field of education. Coursework at CBU focuses on the cognitive development of children under eight, how those children learn, and introduces students to cross-cultural perspectives in teaching and learning. Graduates leave prepared as early childhood educators with an in-depth understanding of the population they serve. UNK was a teacher’s college when it began in the 1920’s. It has since provided high quality instruction to students in a variety of disciplines, including education. UNK’s eCampus is home to forty degree programs, which are lauded for their affordability and rigor. The bachelor of arts in education in early childhood inclusion readies graduates to work with children from infancy through third grade, in both special education and general education capacities. The coursework at University of Nebraska at Kearney focuses on the academic, sociological, and psychological information early childhood educators need to have the greatest impact on early learners. Nebraska residents are eligible to take state education certification exams upon graduating from this program, while students residing in other states should check their state certification guidelines to see if they are eligible for certification as well. National University is a private university headquartered in La Jolla, CA, with other campuses throughout California and Nevada. National University takes an interactive approach to online education, offering courses delivered through streaming videos, forums, and real-time, streaming discussions. The university has 43 bachelor’s degree programs that can be completed at least partially online. The BA in early childhood education is based on guidelines established by the National Association for the Education of Young Children and the Child Development Associates National Competency Standards. The program emphasizes a blend of theoretical knowledge with practical field experiences to produce effective educators in the field of early childhood education. Coursework in early language and literacy, health and nutrition, and curriculum design are grounded in current research and best practices in the field, while upper division electives are available in crisis and trauma studies. Though most of this program is online, NU requires 45 hours be completed onsite at university’s main campus. Mount Vernon Nazarene University is a private liberal arts college based in Mount Vernon, OH. With multiple satellite locations and an online campus, the university is tailored working adults who require flexibility in their education. Mount Vernon offers select online degrees in business and education, and focuses on delivering the greatest return on investment to distance learning students who want practical skills and knowledge to further their careers. The BA in early childhood education can be completed at a pace that suits the needs of the student. Coursework covers topics ranging from classroom management and literacy, to the role of the family in learning. A total of 510 field hours are required in addition to this coursework, and these can be completed at an early childhood education facility of a student’s choice. Graduates leave prepared with the relevant theory and skills they need to succeed in early childhood education. Wilmington University is a private research institution with a main campus in New Castle, DE. Six additional physical campuses -- as well as an online campus -- extend the university’s reach. WilmU Online facilitates 90 degree programs that can be completed 100% online. Award winning faculty members, video conferencing, advising services, and tutoring services make this a solid choice for many online students. The BS in education studies - concentration early childhood education teaches practical and theoretical skills for use in the classroom. Social and behavioral science courses -- along with a fine arts requirement -- prepare graduates to be well-rounded early childhood educators. And two prerequisites introduce a variety of classroom technologies to enhance teaching and learning among students. Mayville State University is headquartered in Maryville, ND and is part of the North Dakota University System. Founded in 1889, MSU has established a reputation for quality degree programs for teachers and educators. The 11 online degree programs in education, business, mathematics, and nursing at MSU are a great value for students looking for small online class sizes, relevant coursework, and attentive professors. The BSEd. in early childhood education is a great fit for professionals already working as early childhood educators and who want to boost their career prospects. The curriculum prepares graduates to work in teaching and leadership roles through a mixture of classes in early childhood pedagogy, child psychology, and a final field experience. Application for licensure to teach birth to third grade is available, giving students the ability to teach children from birth to age eight. Fresno Pacific University is a private Christian university based in Fresno, CA. Known for challenging but flexible programs, FPU grants five different online bachelor’s degrees in education, business, and healthcare administration. The coursework for these degrees can be completed entirely online or in a hybrid in-person/online format. The BA in early childhood education can be completed entirely online, or as a hybrid in-person/online format, and is aligned with the California State Department of Education and the NCATE standards for undergraduate education degrees. The FPU early childhood education bachelor’s degree online offers classes that meet once a week through online video conferencing, which allows working students to fit coursework into their schedules. Early childhood education students complete coursework in child development, childhood play theory, children’s art, literacy, and more. They are also required to take bible theory and religious studies classes, which prepare them to work in private Christian schools as well as public schools once they graduate. Chaminade University of Honolulu, HI is a private Catholic liberal arts university with a commitment toward building a just and peaceful society. Their PACE program is designed specifically for adults and working professionals, with 13 bachelor’s degree programs available fully online. The BS in early childhood education requires a blend of coursework, fieldwork, and online seminars, which give students a range of skills they need as early childhood educators. The online degree has two tracks: the general Early Childhood Education track and the Early Childhood Education: Montessori Credential track. Both offer similar coursework, but the latter qualifies graduates to work in teaching and administrative roles at Montessori schools. Courses in childhood development and mathematics and literacy instruction prepare graduates to be effective educators and mentors of children under the age of six. Vanguard University of Southern California is private, Christian university based in Orange County, CA. Since 2010 it has appeared in the top ten of U.S. News and World Report’s rankings of the best baccalaureate programs in the west. The Professional Studies Department works with adult learners with busy schedules, offering asynchronous coursework and many evening classes. The BA in early childhood education is designed to meet the State of California’s requirements for early childhood educators, and prepares graduates to work in public and private schools. Students in this program complete coursework in teaching math and science, language and literacy, and advanced curriculum design. A special education emphasis is also available, while students may opt for further advanced coursework or three field experiences to round out their degree. Florida State College at Jacksonville is a part of the Florida College System, and is one of Florida’s official state colleges. FSCJ offers online degree programs and several online courses to give non-traditional students the flexibility they need to complete their degrees. All online coursework is delivered through Blackboard, and FSCJ partners with the Florida Virtual Classroom to provide resources and information about courses to online students. The BS in early childhood education equips graduates with the knowledge and skills they need to thrive as educators in pre-k through third grade classrooms. Courses in this online bachelor’s degree are based on the latest evidence-proven educational theories and meet the Florida Department of Education requirements. In order to obtain their degrees, all FSCJ early childhood education students must pass three Florida Teacher Certification Exams (GK, PED, and PK-3). Students residing outside of the state of Florida may have different requirements. University of Toledo is a public research institution originally founded in 1872 in Toledo, OH as a private arts and crafts school. The school has since expanded, offering both online and traditional degree programs from seven different departments. With dedicated online departments, Toledo provides online students with the support and guidance they need. The bachelor of education in early childhood education blends the latest methods in research and practice to create effective educators and leaders. Coursework trains students to become decision-makers in the classroom, and emphasizes the importance of developing relationships with children and parents. This online program is a non-licensure track, it is designed for daycare and preschool administrators and educators who do not work or plan to work in traditional public schools. UT also works closely with students to transfer previous credits earned. Notre Dame College is a Catholic liberal arts college based in South Euclid, OH. Notre Dame College began offering classes to non-traditional students in 1978 through its "Weekend College" program, and the school currently educates professional, working adults through its online degree programs. Online class sizes at Notre Dame College are small, and each class gives students the opportunity to get personalized attention and feedback from their professors. The BA in education - early childhood education license program readies graduates to work as licensed educators in Pre-K through third grade classrooms. The online bachelor’s degree in early childhood education combines field work and relevant teaching theory to ensure graduates are prepared to overcome any of the challenges they may face as early childhood educators. The curriculum and fieldwork are based on the Ohio Standards for Teaching Profession requirements, and application for licensure is available. Many teaching positions require you to hold a master's degree in the field, particularly in positions of leadership. Some teachers opt to earn their master's through online early childhood education programs as they continue working. A master's program can be completed in just one or two years after earning your bachelor's in early childhood education online. The median salary for kindergarten and elementary teachers is $54,550; $45,670 for preschool and childcare center directors; and $90,410 per year for elementary, middle, and high school principals. The BLS projects most positions in the field to grow by approximately 5%. The University of Colorado Denver/Anschutz Medical Campus is headquartered in Aurora, Colorado and primarily serves students in the health science professions. However, its online degree programs extend beyond the health sciences into other disciplines such as English writing and education. CU Denver is an excellent choice for non-traditional students who want to obtain an early childhood education master's degree online; 95% of students work full-time. In addition to traditional coursework, this degree requires students to complete their practicum hours at a qualified educational institution. The core classes teach students about advanced literacy teaching methods and educational statistics. CU Denver’s school of education and human development is the largest graduate school of education in Colorado and has extensive partnerships with urban schools. The University of Dayton is a private Catholic research university in western Ohio. The school has over 3,000 post-graduate degree students taking courses both online and on campus. UD’s online offerings feature small class sizes and hybrid formats for students who wish to complete some of their classes in person. The master’s of science in education in transdisciplinary early childhood development degree program at UD is targeted at students who want to work with young children and their families. The program has a blended format, focusing on both special education and general education. Students are required to complete courses in educational research, statistics, advanced pedagogy, and early childhood literacy. A practicum at an approved early childhood educational institution is also required. The Erikson Institute is headquartered in Chicago, Illinois and specializes in the study of child development. The school is named after the famous developmental psychologist Erik Erikson. Currently, the only online master’s degree offered by the Erikson Institute is a master’s of science in early childhood education. This is a 28-month program that teaches graduates the skills they need to serve in leadership or specialist roles at early childhood education centers. This online master's in early childhood education program focuses on essential childhood development theories, early childhood teaching theories, and leadership skills in the field of early childhood education. Students can elect to add a bilingual/English as a second language specialization to their degree, which requires additional courses in linguistics and ESL teaching theory. West Chester University of Pennsylvania is a public university located about 30 miles west of Philadelphia. It is one of 14 state universities that belongs to the Pennsylvania State System of Higher Education. WCU’s online offerings include four different master’s programs in education, business, and nutrition. Aspiring teachers who want to work with pre-K to eighth grade students can enroll in WCU’s early childhood education master's degree online. Research, courses in advanced teaching theory, and a practicum are all required to complete this program. In WCU’s early education program, students conduct fieldwork during their very first semester of graduate school. Fieldwork is supervised by professors who have extensive experience working with urban or rural populations. The school offers two different early childhood education tracks: a program administrators track and an accomplished teachers track. Concordia University-Chicago is a private liberal arts university with a main campus located 10 miles west of Chicago. CU Chicago offers several undergraduate, graduate, and doctoral degrees that can be earned online in business, education, and arts and sciences. Online coursework is delivered through online lectures, videos, discussion boards, and assessments. CU Chicago’s master’s of arts in early childhood education program teaches students the skills and information required to take on leadership, research, and public policy roles in the field of early childhood education. Coursework focuses on assessment, curriculum development, and professional leadership. This program culminates with a capstone course where students design a project to show that they are proficient in the National Association for the Education of Young Children advanced standards. CU Chicago also offers an MA in early childhood special education. Located about 60 miles northeast of Dallas, Texas A&M University-Commerce is a public research university that belongs to the Texas A&M University System. This school was founded in 1889 and is the fourth oldest university in Texas. Today, A&M-Commerce reaches many online students through a variety of innovative degree programs. Most of its degrees can be completed at least partially online and many can be finished without ever stepping foot on campus. The school currently offers a variety of early childhood education master's degrees online, including an MED, MS, and MA. The coursework for these programs differs slightly. The MA requires students to learn about the foundations of advanced study in the field, the MS requires additional statistics and research courses, and the MED requires additional research and more credit hours. Students can also add an ESL or bilingual education specialization. All ECE students must pass a written comprehensive examination after completing all of their courses. The University of North Dakota is a public research university based in Grand Forks. It was established in 1883 and is North Dakota’s oldest university. Thousands of students are enrolled in online courses and degree programs at UND. Many of UND’s online degree programs boast in-state tuition rates, even for out-of-state students; this includes the school’s online master's in early childhood education. This program awards a non-licensing degree and has coursework that focuses on teaching methods that consider a child’s family, gender, community, and culture. This program requires completion of a two-credit teaching practicum at a qualified school or head start program. UND early childhood education graduate students can also enroll in additional courses to earn the national director credential for early childhood administrators. Stephen F. Austin State University is a public university headquartered in Nacogdoches, Texas. It began as a teacher’s college in 1923 and continues to produce graduates that excel in the field of education. SFA Online is comprised of 20 degree programs in a variety of fields. One such offering is its master’s of education, which provides EC-6 and 4-8 alternative teaching certifications. The coursework in the master’s in early childhood education online program at SFA teaches students in-depth theory and research regarding child development, classroom practices, learning strategies, and child psychology. Classes are offered in half-term formats in the fall and spring semesters, and all courses are available online. Students can choose to take two extra classes or complete a research-based thesis focusing on an area of early childhood education. Graduates of this program are eligible to apply for elementary school certification in Texas and select other states. Mercy College is a private liberal arts institution in Dobbs Ferry, New York with satellite locations throughout the state. It also has online degree programs to serve non-traditional students. The 30 online undergraduate and graduate degree programs at Mercy College are delivered through Blackboard, and online students benefit from video recordings of lectures and discussion boards. The master’s of science in early childhood education from Mercy College provides students with New York State certification to work in preschool through grade two classrooms. The curriculum requirements of the online master’s in early childhood education include coursework that focuses on educational assessment, language acquisition, and child psychology. Field work at approved institutions is also required for every online class. Course requirements differ slightly based on the certification preferences of students, and distance learners residing outside of New York may have different requirements for certification. The University of Alabama at Birmingham is a public research university that belongs to the University of Alabama System. UAB’s eLearning and professional studies department offers several online bachelor’s and master’s degree programs that can be completed entirely online, including a master’s in early childhood and elementary education. Graduate students studying early childhood education online at UAB learn about cognitive theory, literacy and math instruction best practices, and research and assessment in education. A third of the credits needed to earn a degree at UAB consist of field work in approved educational settings. Blended courses that include both online and on-campus class sessions are available, and Saturday and summer classes are offered for some courses. Additionally, UAB has an alternative master’s program that is designed for individuals who hold an undergraduate degree in a field outside of education who want to become certified teachers. Northern Arizona University is a public research university based in Flagstaff, Arizona. It has 36 satellite campuses around Arizona as well as many online offerings. With over 113 online degree programs spread out among 14 different disciplines, NAU is an authority in online education. Most of NAU’s online classes are asynchronous and do not require students to log in and attend class at set times. The master’s in early childhood education at NAU is meant for practicing pre-school and primary teachers who want to develop new skills and methods of working with young learners. Students pursuing an early childhood education master’s degree online from NAU learn about developmental psychology, curriculum practices, and classroom management. They also conduct field work. In order to graduate, distance learners must successfully pass a series of assessments that are embedded into their required courses. Pacific Oaks College is a private college with a main campus in Pasadena, California. It is dedicated to providing students with degrees that are related to social justice, child development, and human development. Several education and human development bachelor’s and master’s degrees available to distance learners. Seven-week courses and a faculty mentorship program are highlights of the online educational experience at Pacific Oaks College. The online master’s of arts in early childhood education teaches students the skills they need to assume leadership roles at schools, state agencies, and nonprofits in the early childhood education sector. Specific course topics include early childhood public policy, family and community studies, and combatting oppression in schools. This master’s in early childhood education online program can be completed in one year by full-time students, but part-time students are also encouraged to apply. Founded in 1835, the University of West Alabama is a public university headquartered in Livingston, Alabama. Fully-online and hybrid degree programs in business, education, liberal arts, and the sciences are offered at UWA. UWA’s master’s in early childhood education teaches subjects related to educational planning, educational research, and technology and education. Students are also required to complete field work at an approved school or organization. Graduates from this program learn the skills and theoretical background needed to become leaders, administrators, advanced teachers, and specialists who work with preschool through third grade students. UWA offers six terms a year that are each eight weeks in length in the fall through spring and six weeks in length during the summer. Students who do not have previous experience with special education must take a general survey course on the subject. Georgia Southern University is a public university based in Statesboro, Georgia. It belongs to the University System of Georgia. GSU is the sixth largest school in Georgia’s university system and has recently expanded its reach by offering online courses and degree options to students across the country. GSU has online programs in healthcare, business, and education. Hybrid course options that combine online and in-classroom activities are also available. GSU’s online master’s in early childhood education is designed for students who are currently certified and working in the field. Curriculum development, learning theories, educational research, and cultural issues in education are emphasized in this master’s in early childhood education online program. Full-time students can obtain this degree in a little over a year by taking classes in consecutive summer, fall, spring, and summer terms. Concordia University-Saint Paul is a liberal arts university based in Saint Paul, Minnesota. It is a part of the Concordia University System, which has many locations across the country. The university currently offers 19 bachelor’s degree programs and 20 master’s degree programs. It is a leader of online education in the Minneapolis-St. Paul area. Online students at CU-Saint Paul have access to an easy-to-use online education portal and a help desk. Online courses in CU-Saint Paul’s master’s of arts in early childhood education are seven weeks in length and explore topics such as the theory of play, emergent literacy, diversity in the classroom, and ethics for educators. In order to be accepted into this program, applicants must be employed in some kind of early childhood education capacity. Nova Southeastern University is a private university with a main campus located in Davie, Florida. Founded as Nova University of Advanced Technology during World War II, the university later merged with the Southeastern University of Health Sciences. NSU currently provides many bachelor’s, master’s, and doctoral programs online. NSU’s master’s of science in education - prekindergarten through primary education curriculum focuses on research, child development, curriculum planning, and educational assessment. Coursework is primarily synchronous and is delivered through real-time video streaming software. Students are required to complete field work at an institution approved by NSU as the final step of the program before they are eligible to graduate. NSU provides online courses through Sharklearn, which is based on the Blackboard learning management system. Biola University is a private, Christian university based in La Mirada, California. It is strongly committed to providing students with a faith-based educational experience. Biola University offers three bachelor’s degree programs and 13 master’s degree programs online. The school’s online programs are delivered through the Canvas learning management system. The teachings of the bible are integrated into course offerings to help students develop academically and spiritually. The master’s of arts in teaching - early childhood from Biola University qualifies graduates to apply for child development permits from the California Commission on Teacher Credentialing. Biola University’s master’s in early childhood education online program covers topics that focus on education, child development, and assessment of early learners. Completion of field work and a capstone research project are also required in order to graduate. The University of South Alabama (USA) is a national research university with a main campus in Mobile, Alabama. USA is the only public higher education institution in the upper Gulf Coast region of the United States. The university serves this region and beyond with traditional and online courses and degree programs. USA’s distance learners have access to online forums and web conferencing. The master’s in early childhood education at USA is designed to qualify graduates for the Alabama Class A Professional Early Childhood Education (P-3) certificate. Some of the course subjects in this program include instructional planning, trends in literacy and math instruction, and educational research. This degree program also requires early childhood education internships. USA’s online offerings are accessible through the Sakai learning management software. Edinboro University of Pennsylvania is a public university headquartered in northwest Pennsylvania. It is one of the 14 colleges and universities that belongs to the Pennsylvania State System of Higher Education. Edinboro University’s online degree programs are delivered through the D2L LMS. Its master’s in early childhood education program teaches students advanced research techniques and practices. It also requires a one-week summer residency that must be attended on campus during the summer after a student’s first year. The remainder of the coursework for this program can be completed entirely online. Course subjects include educational research, curriculum development, and child development. This program also requires students to complete a research project and present their results in a written report to a faculty member. Students may also choose to pursue an additional early childhood education certification. Founded in 1878, Champlain College is a private college with a main campus in Burlington, Vermont. Many of its students are distance learners who complete coursework remotely. Champlain’s master’s in early childhood education takes a project-based approach and utilizes an asynchronous course schedule, which allows students to view lectures, videos, and other course resources on their own time. The specialized tracks in this program include special education, teaching, and administration for early childhood education. Coursework for these tracks differs slightly, but all online master’s in early childhood education students at Champlain learn about essential child development and pedagogy theory. Courses are offered in eight-week terms and distance learners must participate in a four-day, face-to-face academic residency during their first year of enrollment in the graduate program. Northwestern State University of Louisiana is a public university with a primary campus in Natchitoches, Louisiana and additional locations across the state. The school’s online campus participates in the Louisiana Transfer Degree Program, and distance learners pay the same online tuition rate regardless of their state of residency. The online master’s of arts in teaching - early childhood education from NSU meets the standards of the National Association for the Education of Young Children and qualifies graduates for certification in Louisiana as well as select other states. NSU’s early childhood education master’s degree online program requires a year-long internship at a school or early childhood education organization in addition to online coursework. Classes focus on foundational and specialized topics including advanced child development, assessment of children, educational research, and community relations. Established in 1906, Western Kentucky University is a public research university in Bowling Green, Kentucky. The school’s online division has consistently received recognition from organizations such as U.S. News & World Report due to the caliber of its offerings. Support services for online students include tutoring, success coaching, and career search help. The online MAE in early childhood education/teacher leadership prepares early childhood teachers to assume leadership roles. Students learn to create and plan experiences to support the development of infants, toddlers, preschoolers, and kindergarteners, as well as their families, including children with disabilities. This program is offered approximately 80% online and requires some in-person participation at WKU’s main campus or at one of its regional locations. The coursework in the program emphasizes pedagogy, research, and leadership training. Jacksonville State University is a public university based in Jacksonville, Alabama. The university was established in 1883 as a state teacher’s college. Today, the school offers degree programs from all major areas of study, but its main focus remains on teaching educators. [email protected] boasts a dedicated team of IT personnel and instructional designers who ensure that students receive a quality online education. Technical assistance is available to all JSU online students 24/7. JSU offers online master’s degrees in early childhood education and early childhood special education. Online students in these programs learn about technology use in education, children’s literature, educational assessment, child behavior, and educational research. Students who choose the early childhood special education degree program take additional specialized coursework that focuses on teaching children with special needs. Saint Ambrose University is a private liberal arts school located in Davenport, Iowa. It has a Catholic affiliation. The university offers a variety of degree programs and courses that can be completed online. Some courses are available in an asynchronous format, while others must be virtually attended at specific days and times. The curriculum of the online master’s of early childhood education program at Saint Ambrose University focuses on promoting the wellbeing of children, making teachers more self-reflective, and promoting social justice. Course topics include cognitive science, teamwork, literacy development, and professional development. This program also requires a capstone research project. Applicants should have previous experience as a practitioner in an area of early childhood education, including working as a teacher, early interventionist, speech therapist, counselor, or social worker. The University of the Southwest is a private university headquartered in Hobbs, New Mexico. The school provides bachelor’s degrees in several disciplines as well as master’s degree in business and education. Distance learners at USW pay in-state tuition rates, regardless of their state of residency. Courses are delivered through Blackboard, CAMS-Enterprise course management software, and innovative video conferencing. Students enrolled in USW’s master’s in early childhood education online program can also choose to obtain a teaching license while completing their degree. Child development, early childhood language acquisition, nutrition, family and community studies, and curriculum development are major facets of the required coursework at USW. This degree program also mandates that students complete a practicum at an approved early childhood education establishment. Doctorate holders conduct research and evaluate educational modelings, and they apply their research findings in the field. Early childhood education degrees (bachelor's and master's), or those from similar fields, are prerequisites for PhD program entry. Work experience as a certified teacher will also be needed for many programs. In this program, you can expect to participate in faculty-guided research, face-to-face residencies, and online courses. A high school principal earns a median salary of $90,410 per year; $62,270 for instructional coordinators; $72,470 for postsecondary teachers. Principalship positions are expected to grow 6-13% through 2024. Kindergarten and elementary school teachers work in public and private schools teaching students basic subjects such as math, English, and reading. They also evaluate student aptitudes, grade assignments, monitor student progress, help students overcome challenges, and supervise them during lunchtime or recess. These professionals require at least a bachelor's degree, such as an online bachelor's in early childhood education. Effective teachers must have patience, creativity, and enjoy working with young people. When parents and other relatives are unable to care for their children, they turn to childcare workers. They work in centers, which may include their own homes or the homes of children they care for. They monitor the safety of children, organize and supervise meals, change diapers, ensure children have enough rest and playtime, and monitor their development and keep record of their progress. The position requires excellent communication and instructional skills, patience, and stamina. While not always required, professionals who complete online early childhood education programs will be more qualified and stand out to employers. Childcare center directors are responsible for running the day-to-day operations at their facility. This includes supervising preschool teachers and childcare workers, providing professional development to staff, developing programming and standards, working with staff to interact with parents, and preparing budgets. Candidates who earn their bachelor's in early childhood education online are typically qualified to work as childcare center directors. Preschool educators teach children basic skills, such as shapes, colors, numbers, and letters. They create and implement a curriculum targeting different areas of childhood development, design activities for students to explore and develop their skills and interests, and record each student's progress. Creativity, patience, and great communication and organization skills are vital. Earning an online bachelor's in early childhood education will qualify you to work as a preschool teacher at most schools. The Certified Childcare Professional (CCP) credential is designed for teachers who want to demonstrate their knowledge of early childhood development and their mastery of the principles and techniques of working with young children. It is required for those who have yet to complete their degrees or for teachers with degrees in an unrelated field. It can take up to a year to earn the CCP, but the timeline varies from student to student based on their training. If you want to take the next step in your career, you may benefit from the most widely recognized credential in early childhood education. The Childhood Development Associate (CDA) can be earned in four areas: Preschool (center-based), Infant/Toddler (center-based), Family Child care, and Home Visitor. The CDA is "the sole nationally recognized ECE credential, accepted in all 50 states and U.S. territories." It is highly recommended. 120 hours of formal early childhood education training is needed. You'll also need 480 hours of professional experience in the appropriate age group, observation by a Council for Professional Recognition certified Professional Development Specialist, a CDA examination, and a statement of ethical conduct. The ABCTE is an online, self-paced program certifying educators in several subjects and is recognized in 12 states across the U.S. Whether you should get this certification or not depends on the state you live in. But the certification can be used in place of a master's degree to get a temporary teaching license. This credential is a teaching certification providing professionals with an alternate pathway to becoming a teacher if they do not have traditional early childhood education degrees, for instance. It involves two exams: a subject area exam and a pedagogy exam. National Board Certification is the most respected professional certification available in education in the United States. It is highly recommended. NBCTs are recognized for having met the highest standards set by the profession. While each state has its own licensure system, this credential signifies that the teacher has gone beyond state standards. Certification is awarded in 25 areas, from pre-K through 12th grade. Educators can complete the certification process in one year; some may take several years. Each state has its own licensure requirements for educators. Click on State Specific Licensure Requirements, click on your state on the map to see the requirements.